This course will provide educators with techniques for improving instructional delivery for students who are on a path to college. Emphases are on high standards, structuring lessons and mastered literacy. Educators will view the DVD video that demonstrates actual sample techniques of book contents for academic achievement. Teachers are introduced to pacing, creating rhythm and will review critical thinking strategies. Educators will utilize the books content and develop lessons, activities and an essay explaining how the information can be implemented in classrooms and schools. Educators will learn various techniques that put students on a path to college by setting high expectations and standards that will ensure academic excellence. Teachers are presented with developing and structuring lessons that engage students and create a well behaved classroom culture that builds trust and character. Educators will view and write about the books DVD video contents that demonstrate 25 actual techniques that can be implemented in the classroom. 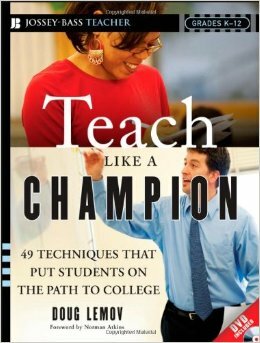 Teachers are presented with 50 techniques such as pacing, creating rhythm, critical thinking and numerous literacy skills that must be mastered for college success. Teachers will develop writings, lessons and activities that demonstrate the books concepts and techniques so they can then apply to schools and classrooms.